When zookeeper Brian Stefanski entered Copenhagen Zoo’s hippo enclosure this morning, he was expecting to find three hippos ready for their morning escapades. Instead, he found four. One of the females had given birth to a healthy 40-50 kilo youngster during the night, much to everyone’s surprise. “We have recently discussed that she would probably have a baby sometime during 2017, so of course it was a huge and lovely surprise that she was already pregnant and gave birth early this morning,” said Stefanski. Usually, pregnant hippos dramatically change their behaviour in the days leading up to giving birth, but there were no discernible signs of that this time. The female usually becomes more aggressive and retreats from the herd, and maybe deposits milk on the floors of the enclosure, but there were no indications of an impending birth this time. According to the head of Copenhagen Zoo, Steffen Stræde, the zoo has enjoyed a boom in births of a number of species this autumn. 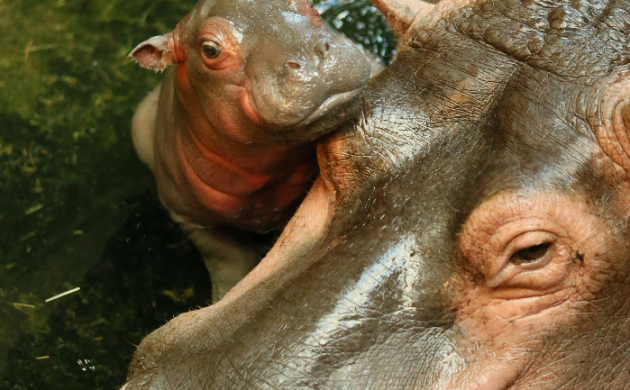 The public can expect to see the zoo’s latest hippo addition sometime in the next 10-14 days.